Several crashes took place across the region, including one in Townsend, Delaware, in which a woman died. Wednesday's winter storm led to slippery roads and crashes across the region. A storm brought snow, sleet and then rain to Philadelphia, the suburbs, South Jersey, Delaware and the Lehigh Valley Wednesday. SEPTA and Amtrak made schedule changes to deal with the slippery conditions. Speed and/or travel restrictions were put in place on many area roads including I-76, I-95 and the Pennsylvania Turnpike. The Pennsylvania Turnpike's westbound lanes are open again after a tractor-trailer jackknifed -- and another tractor-trailer slid into the wreck. The drivers weren't seriously hurt. But the crash shut down the turnpike for about 20 minutes westbound between Exit 320 (Downingtown) and Exit 312 (State Route 29). It was one of several crashes throughout the region Wednesday, when the NBC10 First Alert Weather Team issued a First Alert for snow, sleet and heavy rain for all neighborhoods that was in effect until 9 p.m.
A woman died in a weather-related accident in Townsend, Delaware, around 1 p.m. Police say she lost control of her vehicle and then crashed into a retention pond. She was unable to escape as her car became submerged with water. Eventually rescue divers got her out and she was taken to the hospital where she was pronounced dead. New Jersey State Police reported that they responded to 167 motor vehicle crashes and 137 motorist aids between 6 a.m. and 3 p.m. Wednesday. With schools and offices closed, people were urged to stay home. PennDOT closed Route 422 eastbound just after Trooper Road due to a chain-reaction crash involving about eight vehicles around 11:30 a.m. All traffic had to exit at Trooper Road. No serious injuries were reported. The storm spurred travel restrictions and lower speed limits on the Pennsylvania Turnpike (video showed icy conditions on the turnpike) and major interstate highways. In New Jersey, a commercial vehicle restriction was in place on I-295, I-676, I-195, I-78 and other interstates. PennDOT lowered the speed limit to 45 mph on I-76, I-95, I-295, I-476, I-676, Route 1, Route 30, Route 202 and Route 422. they also lowered the speed limit on routes 63, 100 spur and 309. SEPTA instituted an Early Exit Schedule that started regional rail rush hour service at 1 p.m. to accommodate people leaving work early. The agency also urged people to use caution "as platforms, parking lots and vehicles may be slippery." The Route 10 Trolley also experienced delays. Amtrak also canceled or changed some of its Keystone Service trains. SEPTA made changes to its 103, 104, 110, 114, 117, 119, 12, 120, 124, 125, 14, 18, 19, 27, 32, 38, 40, 44, 46, 48, 52, 57, 58, 64, 7, 92, 95, 97, 99, H, XH routes. Philadelphia International Airport reported delays and cancellations. Deicing operations took place Wednesday. Click here to check your flight status. Passengers flying out of Lehigh Valley, Atlantic City or any other area airports should check the status of their flight before heading to the airport. More than 1,000 flights were grounded around the country. 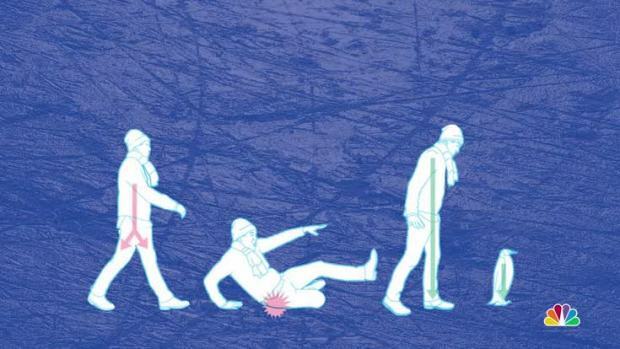 Take this advice on slippery sidewalks: walk like a penguin.